SatFinderAndroid is an Android-based geostationary satellite location and dish alignment tool. It has a database of all current geostationary satellites worldwide, and it provides detailed pointing instructions for all of them. It also has a list of popular satellite receiving dish models with pointing data for them as well. And more, it has a way to superimpose the locations of your selected satellites directly on a live camera picture of the sky at your location. The picture at the top of this page shows a typical display of some user-selected satellites, positioned on an image of the sky in their correct locations. SatFinderAndroid also has a pointing method that looks like this, meant for Android devices without cameras, and that uses your Android device as an azimuth and elevation signting tool. SatFinderAndroid takes what was once a rather complex technical job requiring a knowledge of ZIP codes, city and state names, or geographic positions, plus a hand bearing compass and an inclinometer, and collapses it into an easy-to-use Android application that locates itself, finds your satellite, and then tells you where it is by pointing to it. SatFinderAndroid requires Android version 5.0, API 21, or newer. Hello — I'm Paul Lutus, author of SatFinderAndroid. I've been writing software for about 35 years and have written some very well-known titles (Apple Writer, Arachnophilia). SatFinderAndroid is the third of my Android applications — I wrote it because (as before) there were no Android programs available that filled its purpose. Because a typical Android device is able to locate itself using GPS or network information, and sense magnetic fields as well as local level, it's an obvious, convenient way to locate and install satellite dishes. I hope you like SatFinderAndroid. And stay tuned — I'll be writing more Android programs in the future. The easiest way to get SatFinderAndroid from a camera-equipped Android device is to take a picture of the QR code at the top of this page and download the result. 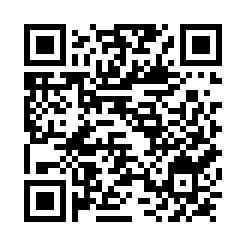 The next-easiest way is to click the download link that appears below the QR code. This only works if you are browsing with your Android device. Another way is to use another computer to download the SatFinderAndroid file, then download it onto your Android device. Programmers: SatFinderAndroid is open-source and licensed under the GPL. Click here to download the source archive. As a programmer and as someone who aligns satellite dishes regularly, I find that SatFinderAndroid greatly simplifies a number of formerly inconvenient tasks. Traditionally, one consulted a table of satellite positions, got hold of a hand compass for azimuth and an inclinometer for elevation of a receiving dish, and finally went out to install or align a dish. But because the Android platform can find its own position as well as sense magnetic bearings and elevations, SatFinderAndroid does all these things in a single application. I think this is a perfect example where mobile computing makes a formerly complex technical task easy. I have some experience writing satellite locator programs. SatFinderAndroid is just the latest (and by far the easest to use) in a series of programs I've written to manage satellite dish installation and alignment. The first was Satellite Finder, a Java desktop application which required the user to specify his geographic location using a ZIP code database, or by specifying a U.S. city and state, or by direct entry of geographic position. Not much fun. The next was an online version of Satellite Finder that worked in much the same way, but didn't require users to download anything. All the prior versions had the drawback that they required users to either have a U.S. ZIP code, or select a U.S. city and state, or manually type in their location's latitude and longitude, assuming they knew it. Those location preliminaries constituted the majority of the code — actually computing satellite positions was comparatively easy. These requirements also prevented non-U.S. users from having an easy way to use the program, all of whom had to manually type in a geographical position. For some use instructions, here is a link to the help page that comes istalled with SatFinderAndroid. SatFinderAndroid is free, it doesn't show ads, it's not crippleware or shareware, and I don't want your money. I just thought I would make that clear up front. Years ago, in connection with my software development activities, I came up with an idea I called CareWare. But as the years went by I became somewhat disenchanted with the original idea and I now find it somewhat overheated (even though it's my idea). So lately, moved as I am by conflicting forces — on one hand wanting to change the world, but on the other not wanting to even appear disrespectful of other people's choices — I've decided to just say pay it forward if you want. But there's no obligation to do that. SatFinderAndroid is Copyright 2017, P. lutus and is released under the GPL. Here is a source archive for SatFinderAndroid, organized as an Android Studio project. 08.02.2018 Version 3.0. Changed target SDK to 26, a recent Google requirement. 10.30.2017 Version 2.9. Fixed a bug that caused an unplanned program exit if the user chose not to allow camera access. 10.19.2017 Version 2.8. Reworked the activity launch code for greater adaptability to differing camera orientations. Relaxed the GPS/Network position handler to reduce the number of updates in a given time period. 10.18.2017 Version 2.7. Recoded the GPS/Network location acquisition code for more consistency and reliability. Added status lights for location quality. 10.14.2017 Version 2.6. 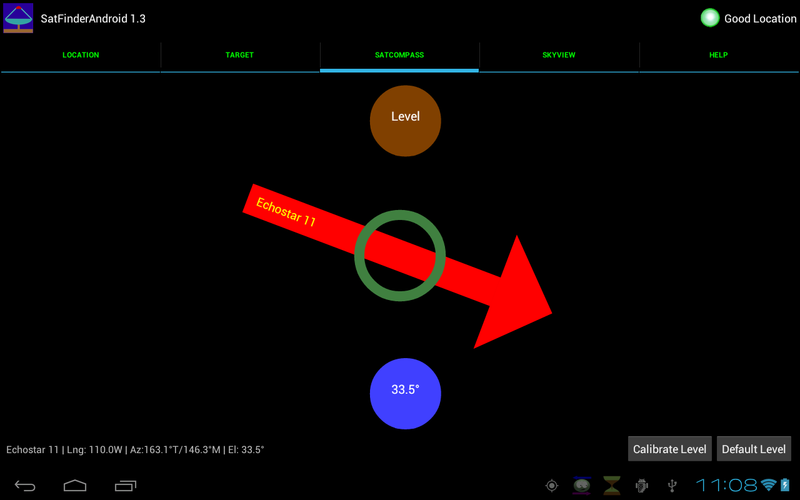 Cleaned up some code sections, impoved SkyView pointing accuracy, added reminders to choose a target if none selected. 10.12.2017 Version 2.5. Based on feedback, added more user guidance into the activity flow. 10.09.2017 Version 2.4. Fixed a data inconsistency/error in the satcompass display page. 10.08.2017 Version 2.3. Added the ability to share satellite data in HTML and CSV table forms. The application generates the data tables and opens a sharing dialog by which the user can share to email, the cloud, and other destinations. 10.08.2017 Version 2.2. With some user reports, added more code to catch and control out-of-bounds conditions and errors. 10.07.2017 Version 2.1. For greater satellite pointing accuracy, further refined the relationship between true geographic bearings and the augmented-reality satellite view overlay. 10.06.2017 Version 2.0. Tested with a number of different Android devices and cameras, tuned the visual geometry code to more closely match the satellite data overlay with the live camera view. 10.04.2017 Version 1.9. Solved the restriction on device orientation — the SkyView and CompassView graphic features now work without regard to the orientation of the hosting device. And through use of updated sensor processing methods, the sensor outputs are more reliable and stable. 10.03.2017 Version 1.8. This version creates live and static results with either true or megnetic bearings, user-selectable, and has a full-screen mode. The use of Network or GPS location access is a user-settable option. The new full-screen mode hides menus and toolbars for a better small-display experience. The live satellite view has a light-color and dark-color option for better viewability in varying light conditions. Cleaned up the code base, adding more tests and error traps. 10.02.2017 Version 1.7. This version represents a complete overhaul. For its live-view feature of satellite locations the earlier version used a camera capture method that had been declared obsolete by Google and had stopped working on some devices. The new version replaces this code and adds a number of new features. The user interface is much improved and works much better on small devices. 01.19.2016 Version 1.6.0. Updated the satellite data list, made some small changes. 10.04.2015 Version 1.5.2. Made some minor code changes to improve the Skyview display, updated the help file. 10.09.2014 Version 1.5.1. Added more proactive guards against program crashes. 05.16.2014 Version 1.5.0. Replaced the magnetic declination computation code with a better, more accurate algorithm. 01.17.2014 Version 1.4.2. Fixed a bug that prevented display updates after selecting a new satellite. 11.19.2013 Version 1.4.1. Updated satellite list. 08.26.2013 Version 1.4.0. Reworked the camera management code to increase the robustness of camera acquisition. 09.10.2012 Version 1.3.2. Fixed a problem with southern hemisphere operation. 03.03.2012 Version 1.3.1. Fixed a geometric bug in the new camera sighting feature. 03.03.2012 Version 1.3.0. 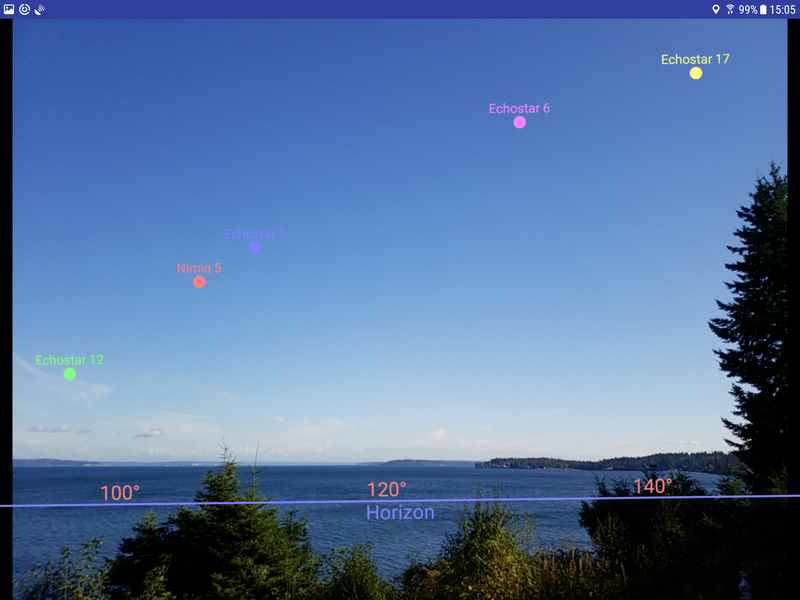 Added a camera-based sighting method that allows the user to see the sky with satellite positions superimposed in their correct locations. 02.26.2012 Version 1.2.0. Fixed two small bugs that produced unexpected results for southern hemisphere locations. 02.23.2012 Version 1.1.0. Edited documentation. 02.17.2012 Version 1.0.0. Initial public release. How do I find the satellites? 1. First, remove your Android device from any enclosure it might be in that has built-in magnets, like those nice tablet enclosures that automatically turn off the display when you close it up. These enclosures do this trick by having magnets in them. This program uses the compass for its real, original purpose, so it can't have any magnets near it. 2. Select the TARGET tab and choose a target. If you have DishNetwork, choose a DishNetwork target, based on which receiving dish you have and how many satellites it picks up. Same for DirecTV — there are lists for each provider in the "U.S." satellite listing. 3. Once you know which target satellite or satellites you want to receive, press your choice, which will turn red. If you can't make your choice accurately, do a two-fingered zoom first (two fingers moving apart in the TARGET display will zoom the text). 4. Now select the SKYVIEW tab. If you hold your Android device in front of you in landscape mode, you should see a blue horizon line and some compass coordinates. 5. Now turn toward the south and sweep across the sky with your Android device, just as though it was a pair of binoculars. Raise your device above the horizon, where the satellites are located, and sweep east and west. You should see satellites superimposed on the camera view, more or less like this. 6. One more thing. If the indicated compass bearings don't match up with reality, and if the satellites aren't located in the sky display where they should be, you need to calibrate your Android device's compass (the is particularly true if the device has been in a protective enclosure with magnets). You do this by turning your device around in three orthogonal axes — meaning turn the display fully around slowly and repeatedly while looking at it, then flip it over top to bottom, then flip it over left to right, all slowly and repeatedly. I hope that was a clear enough explanation, but this page might help. The basic idea of SatFinderAndroid is that it superimposes images of satellites against the real sky, which should give you a chance to position your satellite dish in a way that prevents a tree or building from obstructing the dish's view, before you actually install the dish and find out the hard way.